Among the extensive collection of materials at UTokyo, the extent and quality of Asia-related holdings are particularly noteworthy. Based on this collection, we are planning to create a world-class Asian research center while further expanding our holdings and research functions. 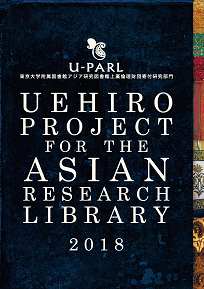 For the conceptualization and realization of the “Asian Research Library,” the new research project division “U-PARL” (Uehiro Project for the Asian Research Library) was established in 2014 through an endowment by the Uehiro Foundation on Ethics and Education of Japan. 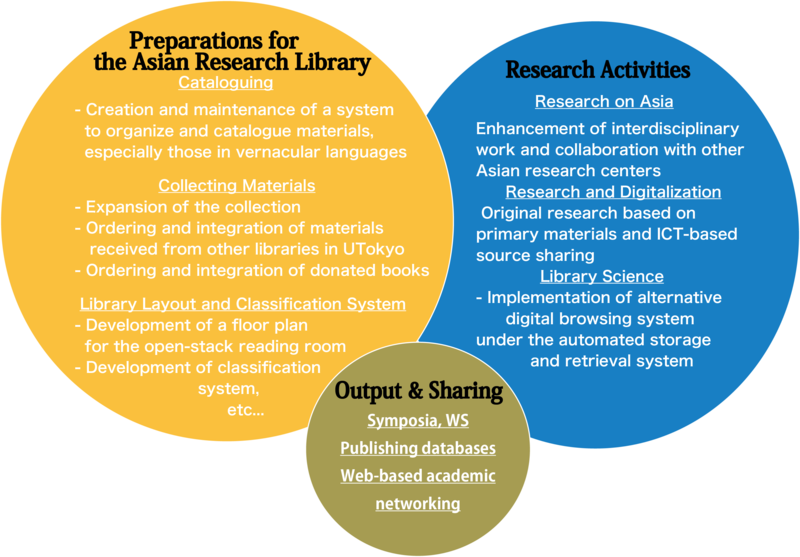 U-PARL is the first research division attached to the University of Tokyo Library System. So far, unlike the specialized libraries belonging to the various academic divisions, the General Library has had no academic staff directly attached to it. There are altogether thirty-five libraries that belong to UTokyo, and many of them are attached to specific faculties, graduate schools, or institutes. While these specialized libraries have developed their collections in close cooperation with the academic staff of these research divisions, the General Library has had no such close relationship to specific faculty members and other academic staff, since its purpose is to support the educational tasks of the whole university. However, we are currently drastically reconfiguring the General Library and plan to establish an “Asian Research Library” that will form part of the General Library. To realize this aim, it is necessary to create a multiplicity of strong links between the library and the university’s educational and research functions. It is for this reason that U-PARL was established. Currently, U-PARL consists of thirteen staff members, including three concurrent professors from the Graduate school of Humanities and Sociology, the Institute for Advanced Studies on Asia, and the Graduate School of Arts and Science, one project associate professor, one project assistant professor, six project research fellows, and two assistant clerk (see the STAFF page for more information). Reflecting the founding principle of the Asian Research Library, U-PARL consists of researchers conducting research on a variety of Asia-related topics in different disciplines. The new library will incorporate materials on all geographic areas and historical periods of Asia, offering a space in which different disciplines can come into contact and exchange ideas. U-PARL has just taken the first step in the realization of this library. The central role in creating and maintaining the library will be played by the professional librarians. Tremendous knowledge and skill are required to register a single book and prepare it for reference. The librarians will be assisted in this creative collaboration between library science and Asian studies by the U-PARL staff. As the chart below shows, U-PARL aims to integrate an Asian studies research facility into the new library and to share its research results with scholars and librarians inside and outside of UTokyo and Japan. By combining the functions of a library and a research facility, U-PARL hopes to provide a unique academic environment. The idea behind our logo is “the fruits of Asia.” The deeply flavored date; the peach or “fruit of the immortal realm” from Chinese mythology; the pomegranate and melon coming across the silk road—many images of fruit run through the history of Asian cultures. Among these, the mango, beloved throughout Asia, and the paisley design, beloved the world over, come first to our mind. At the same time, this shape contains within it our objectives for this project. The sweetness of the mango—one of the elements of our motif—has been made known throughout the world, just as the paisley design has become universal. Following in their tracks, U-PARL hopes to build a library for Asian Studies that connects knowledge from Asia to the world over.